Wash, peel and chop raw, fully mature onions into about 1/2" pieces. There is no need to blanch onions. Bag and freeze in freezer bags for best quality and odor protection. Package -- flat -- in freezer bags to hasten freezing and make it easier to break off sections as needed. 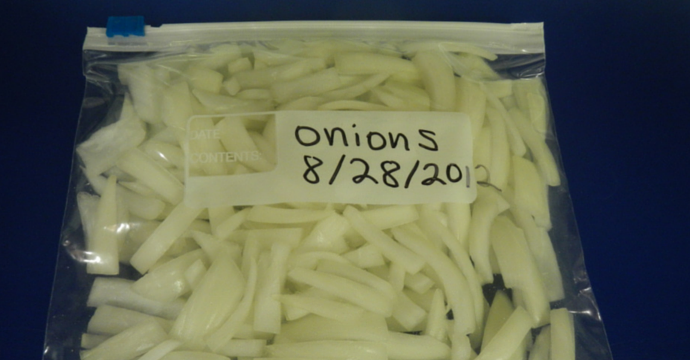 Express out the air and place bags on cookie sheets or metal pans until onions are frozen. Then, restack bags to take up less room. One medium onion yields about 1 cup of chopped onions. Use low or medium heat when sautéing onions. High heat will make them bitter. Reduce crying when cutting onions by first chilling them for 30 minutes. Leave the root end intact when cutting onions. The root end has the highest concentration of the sulphuric compounds that cause tearing. Approximate Yields for Canned or Frozen Fruits and Vegetables; Weights and Measures (Source: Clemson University Cooperative Extension) Weights of produce, such as for bushels, crates, lugs, etc (scroll down the page). They also tell the pounds of produce needed for 1 quart jar or container. NOTE: Tomatoes are in the fruit section.